A NEW pilot study report ReThink Plastic has demonstrated that changing behavior can reduce the health hazards associated with the toxic chemicals in plastic. Plastic Pollution Coalition served as co-investigator along with Child Health and Development Studies for the pilot study, funded by California’s Breast Cancer Research Fund. According to the report, the study was effective at reducing exposure to chemicals in plastic with change in nearly every behavior queried on the pre- and post-test surveys being statistically significant and in the desired direction. Based on these findings and with the funder's encouragement, the investigator team submitted a three-year grant proposal to expand the study. The chemicals used in the manufacture of many plastics are known to mimic estrogen activity. There is strong scientific evidence linking these "environmental estrogens" to breast cancer. The ReThink Plastic study was designed to reduce exposure to these chemicals using simple, practical behavior change and to spread the study messages to reduce plastic use. The ReThink Plastic study was successful at reducing exposures to harmful chemicals in plastic which mimic estrogen. The results showed that in a short education program, participants can significantly change their behavior. Statistically significant change in the desired direction was noted on nearly every behavior queried on the pre- and post-test surveys. 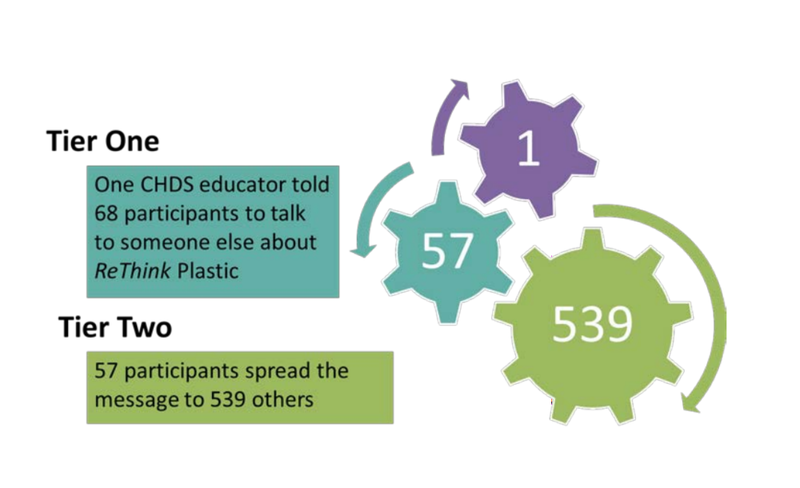 Further, the ReThink Plastic study was successful at getting people to talk to members of their families, friends, and communities to spread the study messages. Ninety-Three (93) participant were recruited from the San Francisco East Bay through African American Churches and local community colleges. After taking a pre-test, they were presented with a 45-minute education program conducted by the co-investigators. A subset of the group, post-menopausal women, were recruited to take a blood test to assess their overall estrogen levels. Participants were instructed to reduce their use of plastic, specifically focusing on food purchase, preparation, and storage for a month. A follow-up discussion session was conducted one month later in which the participants took a post-test. Store food in glass or ceramic containers. Skip canned foods and beverages. Don’t handle receipts with bare hands. (If you do, wash with soap and water as soon as possible and DO NOT use hand sanitizer). Participants were willing to provide blood samples and the AroER tri-screen blood test that measures overall estrogenic activity showed very promising preliminary results. Further testing is needed. A basic assumption of the study was that 80 percent of people's exposure to the estrogenic chemicals in plastic come from food purchase, preparation, and storage. The pre and post test focused on the following behaviors. Participants were asked to talk to family, friends and social contacts about the six Study Messages. From 57 of the original group participates the message was spread to 539 recipients. With the results of the pilot study now available, the ReThink Plastic team of investigators awaits news of funding for the full three year grant. In addition, the team awaits news on funding for the additional pilot study of the AroER tri-screen blood test's validity which will assess overall estrogenic activity in the body, in lieu of testing for specific chemicals.